The most valuable relationships are not made of two people, they’re made of three. Generates fresh triads of team members to meet every week in an informal standup, or S'Up. This bot generates fresh triads of company members to meet every week in an informal standup, or S'Up. It also introduces itself to new team members and can help setup a GCal meeting. S'Up will then ask whether you met and keep track, a few days later. Don't want to participate? Send a DM to @sup with opt out to opt out or opt in to opt back in. 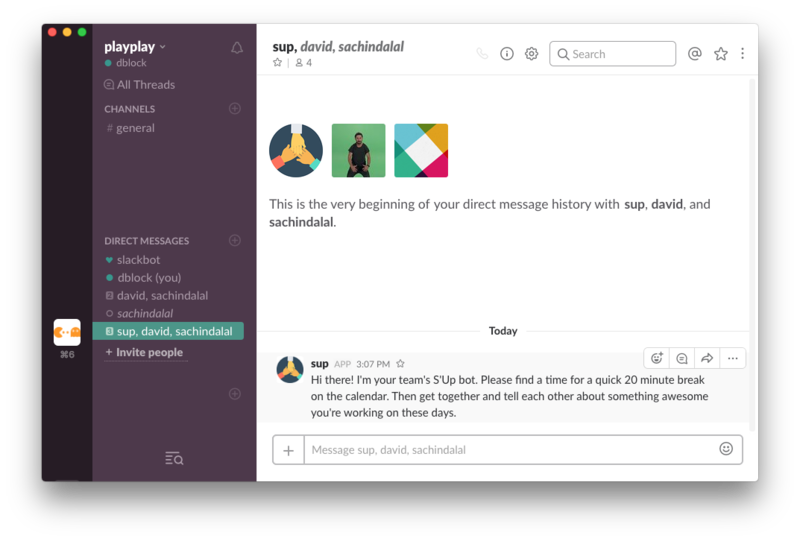 S'Up lets you configure the team's timezone, the number of people that meet, how often S'Ups are created and when to notify the team. 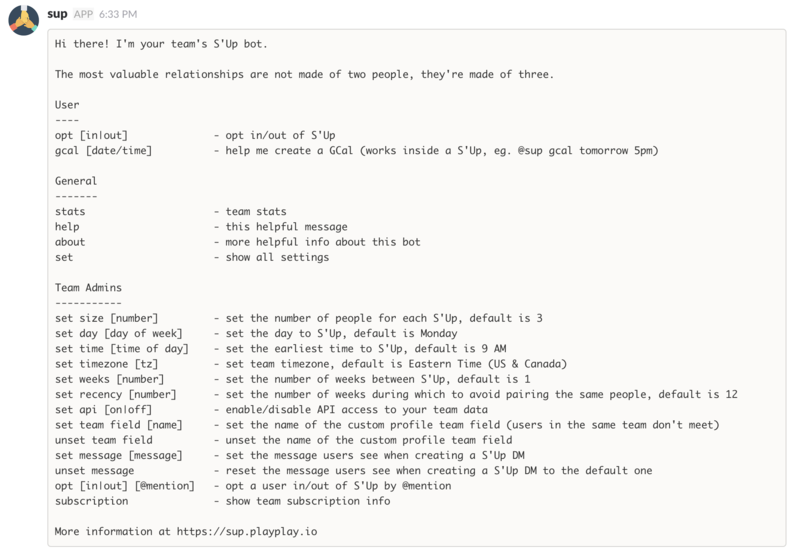 You can also customize S'Up messages and take advantage of custom Slack fields to improve matches across subteams. Finally, S'Up provides some statistics about the meeting outcomes. The bot service is open-source under the MIT license. 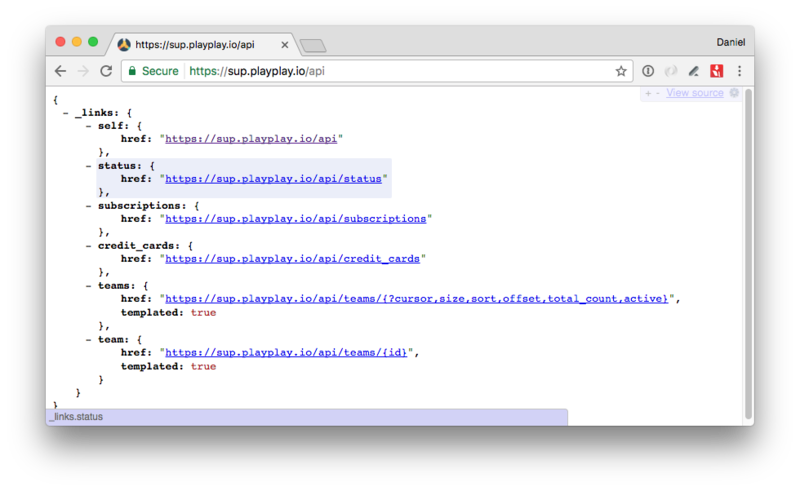 Your team's data belongs to you and is available via a Hypermedia API. You can try S'Up for free for 3 weeks without a credit card or personal info. Subscribe for $39.99/yr thereafter. We're not trying to make money, but we need it for hosting. We also give a lifetime subscriptions to contributors to our open-source code. 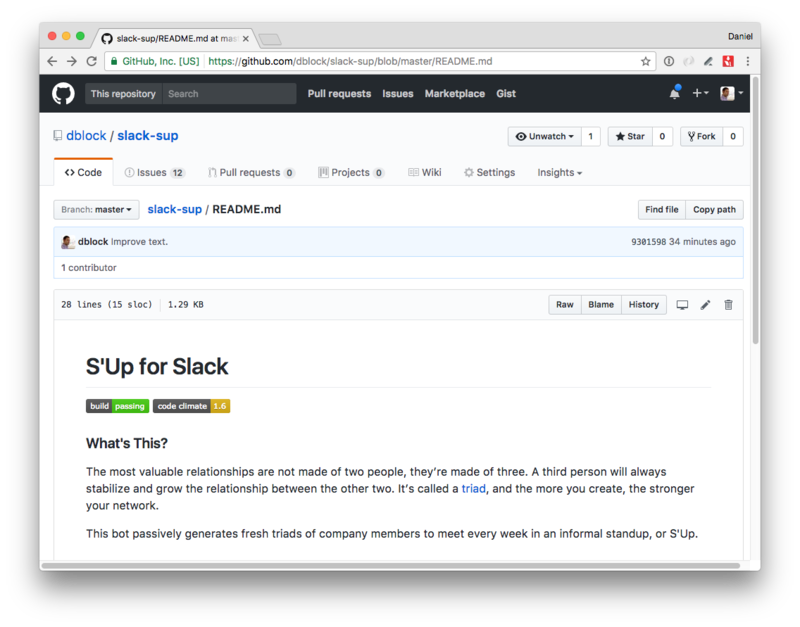 S'Up for Slack is made possible with the generous support of team Artsy. Written by @dblockdotorg during @ArtsyOpenSource Hackathon 5.0. Fork me on Github, open an issue, tweet at @playplayio, or e-mail dblock[at]dblock[dot]org.